African Safari, Lake Nakuru, Kenya P1. P2. P3. I am told Lake Nakuru is the third most popular destination for Kenya Safari travellers. I can see why. The Lake Nakuru scenery is very varied, wide open spaces, thick woodland and forest, cliff faces and high ground plus of course the lake in the middle. No flamingos though, or only a few dozen. But we saw plenty of other animals including this one of a pair of hyaena that had taken a gazelle. Getting the kill was only the first part of the problem though, because within just a few minutes there must have been fifty vultures watching and waiting. There is obviously some sort of game plan and large numbers of vultures would harry and fluster around the hyaena which would initially ignore them before eventually charging and chasing them away. 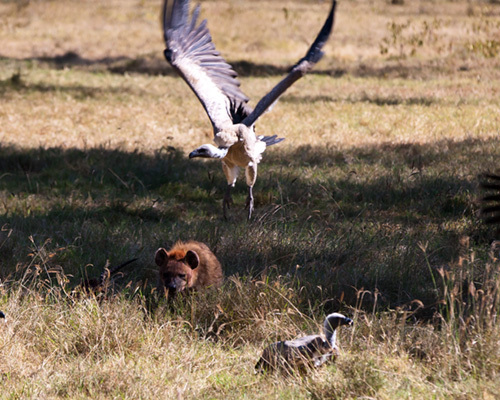 As he chased the harassing vultures, other vultures would swing in behind and grab chunks of flesh from the kill. 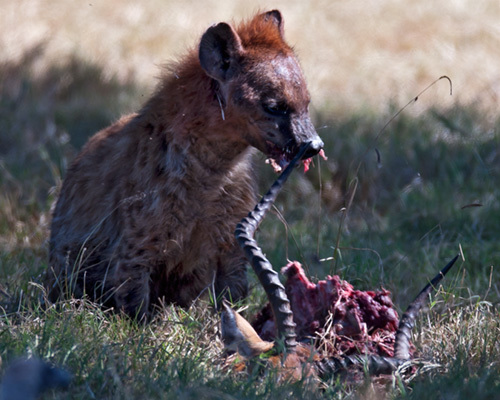 Apparently getting wise to this, on several occasions, when the crowd of vultures got really large, the hyaena would back off a few yards and turn as if leaving the kill. 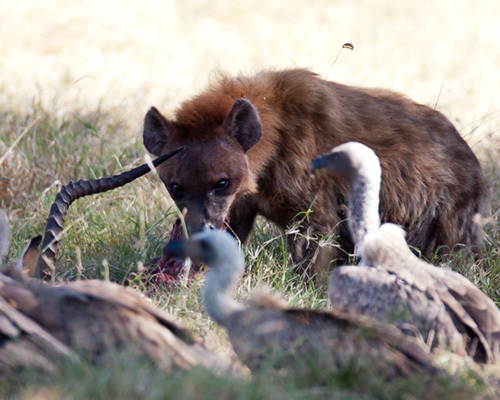 But as the vultures moved in, their attention now on the kill, the hyaena would sneak in and make a grab for them. He never caught any, but he got very, very close and after a few attempts, the vultures wised up and moved back to the trees to wait their turn on whatever was left for them. 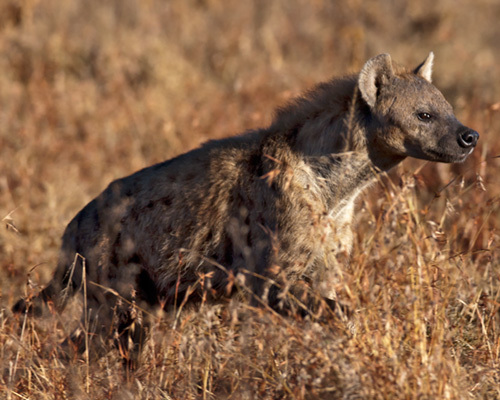 The hyaena hen ate at leisure. The hyaena at bottom right is a striped hyaena, very solitary and very rare, I am told, so seldom seen. We spotted this one very early in the morning but he did not want to be photographed and very quickly moved into the long grass.